Morning Peeps, time for another Cupcake. And this week, Liza has chosen a fab challenge that made my tummy sink with fear! Lots of Layers. I struggle with putting colours and papers that match together, so lots of layers had me running for the choklit! ;) We are joined this week, by our lovely regular sponsor; Crafty Emma's Store and this month our Icing on the Cupcake sponsor is Bunny Zoe's Crafts. Last week, Donna sent me a lovely parcel of stash (thanks Sweetie). Donna's packages always come in a box filled with polystyrene packaging beans. Sweet Cheeks loves these beans and will play happily with them for days. Last week, Sweet Cheeks was so 'into' his beans, that one day when we were going out, he insisted on packing them in his little Lightening McQueen bag so he could take them out shopping with us! Sadly, they are no more, as they turned to moosh after being left in his 'bubbles drinkie'. AKA Tap water! He likes the fizzy water I drink, but is not allowed it very often. Luckily, he's not sussed that the water that comes out of the tap is not actually bubbly! Hi Faye, Gorgeous card! Love this sweet image and the papers go together beautifully. well this is just adorable...fab little chickadees. Beans...would that be the same thing that Holly calls cheesy wotsits!! Morning Fluffy. I am with SC on this one, I used to take "beans" to Playgroup all the time and the kids would love to stick them together and make "Aliens" we loved it. THEN about four years ago the powers that be, that protect children (and stop them PLAYING!! ), said "beans" are DANGEROUS if swollowed....Isn't anything that a two year old swollows dangerous!! This is such an adorable card, Love those papers, and your colouring is always spot-on, think I need lessons. I dunno why layers worried you, you got this perfick! Hiya Faye. This is so sweet. 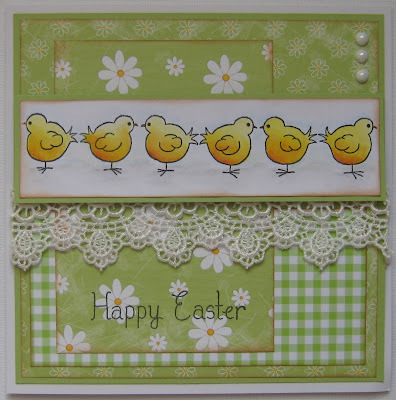 Such a pretty easter card you have made! Hi Faye, just visiting to catch up with your latest cards sweetie! They're gorgeous, you've done a wonderful job with these layers, but my especial favourites are your '2 of a kind' cards, stunning! Well what a gorgeous card! Agree with everyone else, don't know why you were worried about layers. Professional as ever. Thanks so much for doing our stamp justice!! 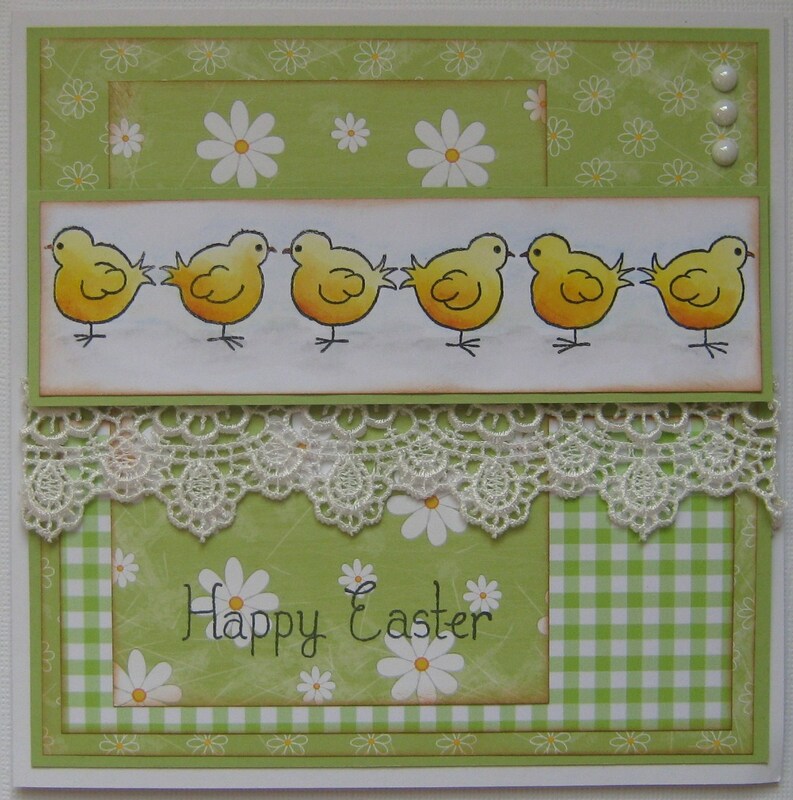 A great easter card Fluff and fabulous co-ordinating papers! Love the papers in this Faye! The lace is gorgeous too! Very elegant! I see you have been very busy ! Love the cards you have made ! Gorgeous as always, and great to hear what SC is up to! I got lots of beans for Sweet Cheeks! !